Swelling in left leg can be a scary thing to see, but that doesn't necessarily mean it is going to threaten your life. Learn the causes and best ways to help. Leg swelling can be a common problem and it typically refers to any swelling of any part of the legs, including the feet, ankles, thighs and calves. There are many reasons for leg swelling, but ultimately, the reason stems from fluid buildup or inflammation from your joints or tissues. These are often brought on by an injury, prolonged sitting or standing, or a more serious disorder, such as a blood clot or issues with circulation. In some cases, your left leg can swell more than your right. When you have severe arthritis in the knee or the ankle, it can lead to serious swelling of the leg. This can also be a very painful condition that can make it difficult to move or bend your leg, or even to put weight on the affected limb. Arthritis can be a very serious condition that requires medical attention to prevent further damage to the leg, joint or surrounding areas. Many people believe that blood clots in any area of the body are going to hurt, but that might not be the case. Sometimes the first and only sign of a blood clot in one leg is the swelling. Other signs might include a lack of feeling in the leg, or pain in the affected area, or even a tingling, numbing sensation. The leg might also feel hotter or colder than the other leg does. It is important to get immediate medical attention if you suspect a blood clot. This is one of the most common causes of swelling, but it usually affects both legs. When it affects just one leg, which might be concerned, be sure to mention it to your doctor. Water retention can be caused by something as simple as standing up all day, but it can also be the result of serious problems, such as kidney failure or heart disease. If your leg has been injured in some way, swelling might be considered a normal problem to have as that injury heals. A fracture of your leg, a serious bruise from bumping something, or other types of injury can lead to swelling of the leg. Unfortunately, this kind of swelling can increase the pain of the injury, so it helps to speak to a doctor about what you can do to relieve the swelling. Some other causes that lead to fluid buildup in the legs might include kidney problems, heart problems, and blood clots in the legs, hormone therapies, pregnancy, and prescription medications. Sometimes even ibuprofen – a medication you might take to decrease inflammation – can actually cause the swelling. Many injuries can lead to inflammation of the area, and that naturally leads to swelling as well. Sometimes your leg might look a little more swollen than the other, but is it really swollen? There are a few ways to tell. First, look at the legs side-by-side. Is one larger than the other? 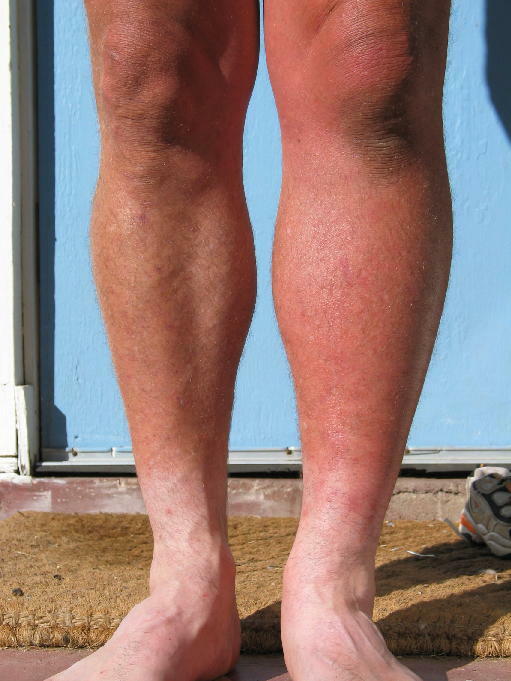 A swollen leg might appear shiny or glossy, and the skin might feel tight. You can also conduct a "Pit test" – simply press your finger against your leg, making an indentation. When you remove the finger, does the indentation stay there? This is a sign that you might have serious swelling. Contact your doctor if you think you might have swelling of one or both legs. In many cases, relieving swelling in left leg can be as simple as a RICE treatment – Rest, Ice, Compression and Elevation. This means you should rest your leg, elevate it higher than your heart if possible, use compression stockings or other compression gear to ease the swelling, and apply ice to the area, especially if it is painful. There are other things that might help you avoid or eliminate leg swelling. These include a low-salt diet, plenty of exercise to keep the blood flowing through your legs, and wearing support stockings underneath your clothes. Lose weight if you need to do so, and make sure your doctor is aware of all medications you are on. Also, keep your leg elevated, don't stand for long periods of time, and move around often instead of sitting. When you travel, avoid tight clothing, such as garters around your thighs, and be sure to get up and move around often – don't just sit through an entire plane ride! Keep taking all your medications, and if your leg swelling is causing pain, take some over the counter medications to help. Note: Since there is no way to be sure what is causing the left leg swelling, a visit to the doctor is in order. Make an appointment as soon as possible. Sometimes the doctor visit simply can't wait. If you are dealing with a swollen leg and you experience other symptoms, it's time to go to the emergency room. These include if the swelling occurs for no apparent reason, comes on very suddenly, or is the result of an accident or injury. In that case, get to the hospital as soon as you can. If you experience chest pain, fainting or dizziness, confusion, or difficulty breathing, call for an ambulance, as these could be signs of a very serious situation.